Tiny tablecloths were never on my mental list of things to collect. I have to admit that the moments of discovery (Oooooooh! 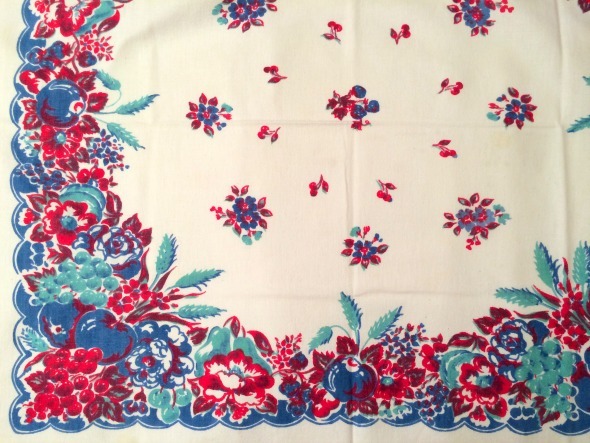 A tablecloth!) have always been followed by a letdown (Shoot! It’s small!) But that hasn’t stopped me from buying them anyway. 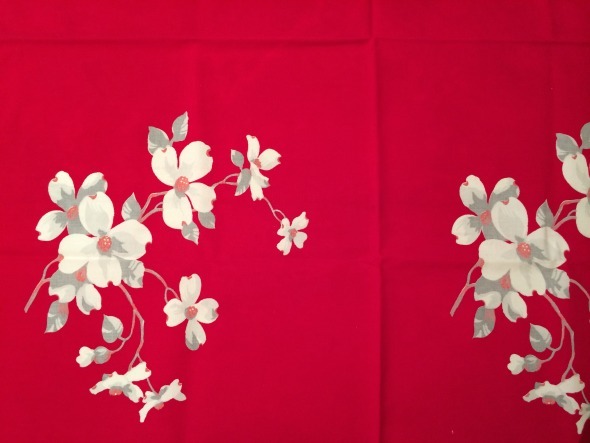 A Facebook commenter pointed out that some tiny tablecloths are merely cut down from larger pieces. Here’s a Wilendur that’s hemmed on all four sides. It was sewn by a perfectionist who made it exactly 34″ square. More background than pattern, this common Wilendur is still BRIGHT red after all these decades. I like the subtle pink and gray highlights. So 1950s! Wilendur tablecloths frequently feature repetitious designs set in a grid. From a marketing perspective it’s a brilliant idea. 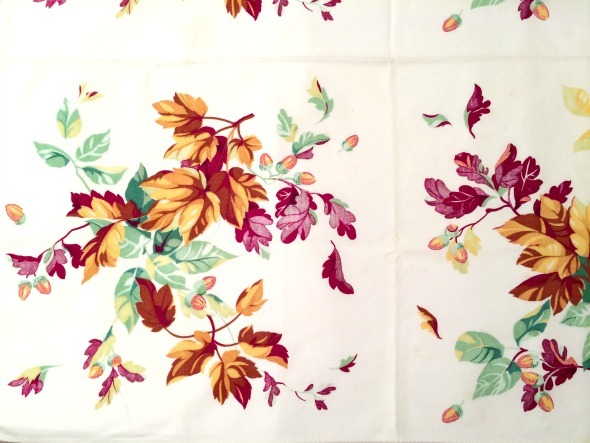 They could use the same yardage to create a tablecloth 48″ or 120″ long. 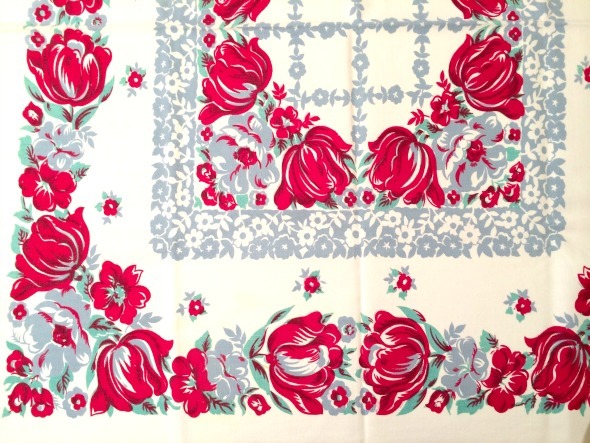 This tablecloth is cut and hemmed on all sides to 34 by 36 inches. I love this Wilendur pattern even though its waaaay out of my usual color choices. 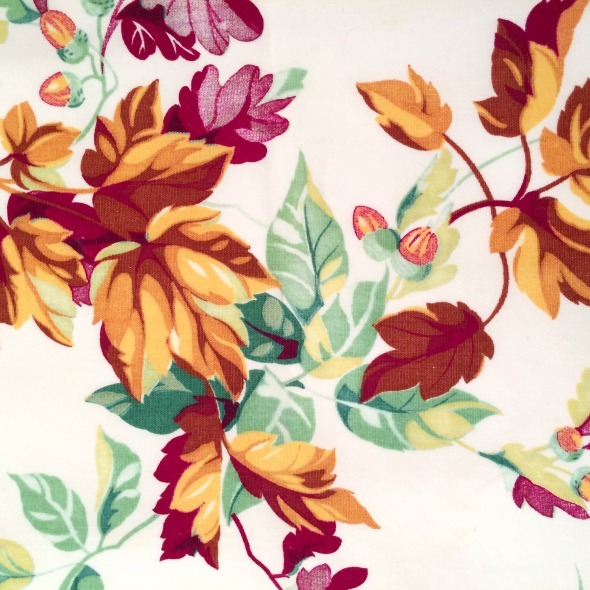 I’d love to find this pattern in a huge size for a fall dinner party table. (I’d happily ignore the color clash in my dining room.) Unfortunately, it would have an equally huge price tag. I know–I’ve looked on eBay and Etsy. I don’t need it so it’s not going to happen unless I miraculously find one in the wild. Fat chance! I’m just a sucker for the jadeite green! I’d make it work with my fall dishes. I’m sure there are lots of people who avidly collect Wilendur tablecloths. Honestly, I prefer complex borders of the designed-one-size cloths. This one is hemmed on two sides and measures 29 x 34 inches. More jadeite green mixed with red and blue. And crummy lighting that makes the center look pink. Oops! Nothing realistic here except the shapes! 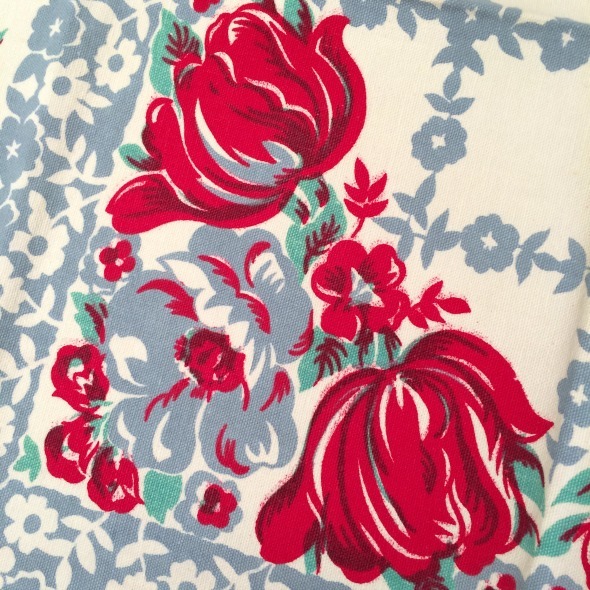 Last but not least, a wild floral border. 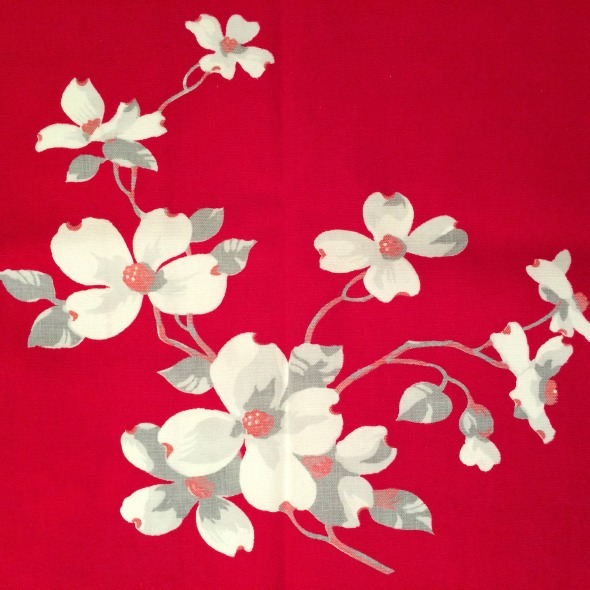 This one is also hemmed on two sides only and measures 32 by 36 inches. Eye smacking red, isn’t it? Yummy! I’m always impressed by how much mileage designers could get out of two or three colors. 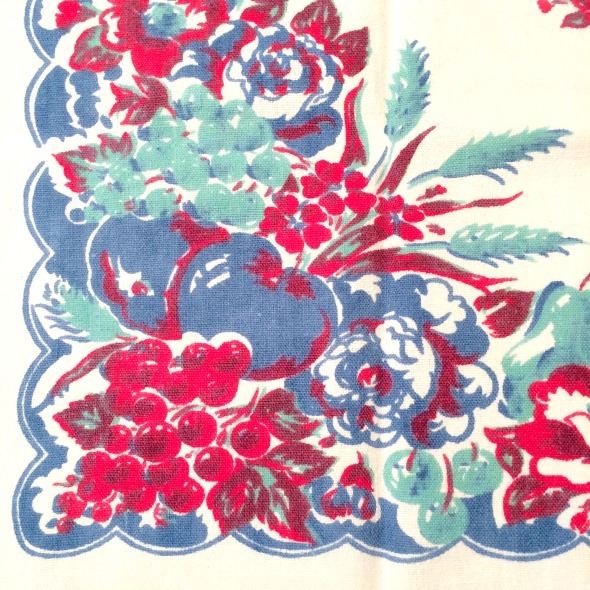 Lovely details in this print, especially the positive-negative little flowers and leaves. So that’s it for my entire tiny tablecloth collection. Sometime in the future I’ll have to show you how I use them. Stay tuned!